We’re just a few days away from the Grand Prix Final kicking off as a “preview event” of sorts for the upcoming Olympic Games in Sochi, Russian. And, the contenders are all very much aware of this, I promise you. Everyone wants to get a glimpse at what it might be like to skate in the arena where new Olympic champions will be crowned. And, this is that chance, albeit under a teensy bit less pressure. Still, the energy will be high as the conclusion of the Grand Prix series gets underway. It’s been an interesting season. We’ve had moments of brilliance and competitions as tight as ever, in some cases. Most of the stops along the way produced high-quality skating. It is, after all, the buildup year to the Olympics. Everyone is starting to make that extra push. But, there were a few let downs, too. This isn’t a recap, though. If you’re looking for that, check the posts from a few days back. It’s all there: the good, the bad, and the ugly. This, though, should be quite good. The way I see it, each of the pairs competing here are primed for the performance of the seasons. We haven’t seen too many magical pairs moments yet this year, especially from the top teams. But, with three Russian teams in the Final, two Canadian teams, and just one Chinese team, there’s been a shift in the power houses of the Pairs world. Notably absent, Aliona Savchenko and Robin Szolkowy who didn’t not qualify after skating in just one event. Tatiana Volosozhar and Maxim Trankov have yet to wow me this year. But, they do still hold the top international score. When they put the pieces together, they are hard to beat. They are just so good. Vera Bazarova and Yuri Larionov continue to steadily climb towards the top. They’re not there yet, however. This is a great chance for them, though, to stake their claim to a spot on the podium — here, and heading towards Worlds. The third Russian team is, surprisingly, not considered a medal favorite. Yuko Kavaguti and Alexander Smirnov have struggled to match last year’s brilliance that, too, fell off a bit towards the end of the year. Perhaps this is their time to jump back into the upper echelon of Pairs teams? I see a team like Qing Pang and Jian Tong and am blown away. Not by their technical brilliance these days, but by their undying passion for the sport. Why, after all these years and all the medals and titles won, do they still need to push themselves? Why would they delay their wedding in order to compete, when they openly admit their bodies often don’t cooperate anymore? How can they still perform such difficult programs? But, even more impressive, is the emotion with which they skate. That was something I always found a bit lacking in their skating, but the older they get and the they compete “for the love of the game,” as they say, the more joy shows in each move. It’s beautiful, not matter where they finish. And how ’bout those Canadian teams? Are we witnessing the rebirth of the Russia vs. Canada pairs rivalry? Not quite yet, perhaps, but by the time they return to Sochi? Possibly. Meagan Duhamel and Eric Radford are living proof of determination directing results. These two know what they want and have developed a formula for how to get it. No, they can’t yet compete with Volosozhar and Trankov. But they put themselves in medal contention in every event the enter. In fact, they have a chance here to knock off the veteran Chinese team and land on the podium. It would be an upset, but we’ve certainly seen one or two of those at a Final before, haven’t we? Kirsten Moore-Towers and Dylan Moscovtich have a longer way to go. I’m not entirely convinced this season’s programs are the best vehicle for their skating, but they continue to fight and make something of each event. They are in the Final after a tie-break gave them the last spot. So, there’s really no pressure. That might be just the situation they need to excel. Have I mentioned I love this event? There isn’t a team scheduled to compete that doesn’t deserve to be there. There are, however, teams that didn’t make the Final that arguably should be in Sochi right now. That’s besides the point, though. And now it’s all about these top six couples. Again, Russian is well represented with Ekaterina Bobrova and Dmitri Soloviev and Elena Ilinykh and Nikita Katsalapov set to take the ice in front of the home crowd. Both teams are much improved. Both have dances that don’t quite make sense to me, but perhaps they appeal more wildly to a Russian audience? Both teams have two second-place finishes this season, and would love to make the podium. However, there are some pretty tough challengers standing in their way. The same could be said for Italians Anna Cappellini and Luca Lanotte. They are divine. I adore their unassuming charm as well as their ability to sell a character-driven piece as well as anyone in the business. Their improvements this season are quite impressive, and they continue to make me believe they could be a contender in the near future. Again, though, the top three teams in the world are pretty set in stone at the moment. Nathalie Pechalat and Fabian Bourzat are another team — similar to Pang and Tong — that wow me with their consistent improvement and commitment to a long-term plan. I often struggle with the far-out nature of their creativity, because I don’t know that it translates as well as they’d like it to. But, I admire their dedication to maintaining artistic integrity despite the demands of the system. They are much improved technically, but still not quite where they’ll need to be to break up the top two. It wouldn’t be ice dance without a little drama, eh? For my take on the wide-swinging pendulum of opinions on Meryl Davis and Charlie White’s free dance vs. Tessa Virtue and Scott Moir’s free dance, check this piece out. I present my own opinion, but also give you the bare facts and numbers, in case you could care less about my private opinion. These two teams have made each other better, that is the one thing I can, without a doubt, guarantee. As they continue to push one another, they in turn push the entire sport. I’m amazed when I watch them both, because of the complication of each piece of choreography. There are no simple movements in their programs. No easy steps. No basic strokes. And yet, they combine the difficulty with basic skills that make it all look remarkably easier than it actually is. Plus, you add the layer of story telling and passion and connection and emotion … there’s so much to the package — for both teams — that I don’t know how they pull it all off. They’re like machines … with pretty costumes and powerful expressions. Every conversation about these two should start with the simple fact that both teams are extraordinarily good at what they do. Ice dance has fast become one of my very favorite events. It’s the discipline that I think has benefited most from the Code of Points system because things are actually quantifiable now. Of course, it helps to have a generation of dancers actively working to live up to the likes of Tessa Virtue and Scott Moir and Meryl Davis and Charlie White who continue to lead the way. The Grand Prix series this year gave a good indication of the progress some dance teams have made … perhaps none more notably than Nathalie Pechalat and Fabian Bourzat. Those two are always creative … sometimes distractingly so. But the technique often suffered in the past for the sake of creativity. Not so much this year. Theyr’e still not quite there yet, as far as Virtue/Moir or Davis/White standards, but if the top two don’t watch their backs and step up their own games, the Olympic year could be way more interesting than the last few have been. It’s interesting, in that regard, how teams that have generally been very politically correct in answering questions about their competition goals who are suddenly voicing their determination to be THE best, both at Worlds this year and, more importantly, the Olympics. Pechalat and Bourzat are certainly a part of that new trend, early this season stating — quite emphatically — that they are right on track with their career goals that have them peaking in Sochi. So far, they’ve skated accordingly. Speaking of teams that have made marked improvements, Russians Ekaterina Bobrova and Dmitri Soloviev are another such team. Personally, they’re not my cup of tea. But that’s the thing about ice dance (and skating in general) — it’s okay to not fall in love with every team or every performance, even if other skating fans do. And even if their basic skating has improved, I’m not in love with their programs, though I can respect their attempts at creativity. Want to know what team I am impressed with, on a multitude of levels? Anna Cappellini and Luca Lanotte. They were adorable last year, with charming choreography and fresh exuberance. This year, they’ve conditioned themselves into legitimate competitors on the world scene. Maybe not World medal contenders, since the top three are on a whole other plane, but they’re nipping at their heals. That medal stand isn’t far off, for sure. Elena Ilinykh and Nikita Katsalapov also made the Final with a pair of silver medals. They did so relatively quietly, perhaps because they didn’t stand a chance against Virtue and Moir or Davis and White. But, I have to say, their programs — especially their free dance — don’t do them justice. Side note: I’m super disappointed the reaction to Kaitlyn Weaver and Andrew Poje’s free dance wasn’t better from the judges. It’s beautiful and creative and original and magical and … yeah. Unfortunately, it didn’t lend itself to the complexity that the new system rewards. And as a result, they miss out on the Final. Sad day. Now, for the top two teams. It’s interesting, the ice dance world. I can’t say I realized how drastic the difference of opinions is between Canadians and Americans until this season with Tessa and Scott’s “Carmen,” and Meryl and Charlie’s “Notre Dame de Paris” free dances. I’ve heard opinions blasting Davis and White for goign away from the kind of character and passion they’re good at — the “at a distance” kind — while praising Virtue and Moir for trying something new and challenging. I’ve seen fans gush over the magical moment Meryl and Charlie create while recoiling in a flash from Tessa and Scott’s dark, seductive choreography. If you want my opinion, I prefer Davis and White’s dances. I appreciate the way they’re trying to stretch themselves, and while some feel they don’t actually tell story of the hunchback and Esmeralda directly enough. However, I find myself memorized by the picture they do create and yes, I do see improved connection and passion. Now, I’m going to try not to contradict myself, so hear me out. I do appreciate the attempt at something new for Virtue and Moir. I get where they’re trying to go. However, this team’s strength is, without a doubt, the way they can stretch each move, and wring out every drop of emotion from it. The romance they can create is second to none. They elegance is something that sets them apart. And their ability to tell a heartfelt story that captivates an audience with artistry and grace while performing technically brilliant and complicated choreography is what made them Olympic champions. This modern dance version of Carmen? Not any of those things. Again, I understand where they’re trying to go. It’s different. It’s edgy. But while I feel Davis and White’s “different” stems from their strengths, I feel this “different” is an attempt to recreate the wheel. The super-seductive “passion,” cheapens the quality of their movement, and obstructs the flow and connection they have with one another and that their blades have with the ice. To me, it doesn’t bring out their best qualities while making them more versatile. And, if you really don’t care what I have to say or what my opinion is, I’ll just give you the facts: the judges like the American’s free dance better. Exhibit A: the score breakdown from both teams’ first Grand Prix event, wherein Virtue and Moir edge Davis and White in TES, but Davis and White win the PCS mark and the total score. And, exhibit B: the same comparison from both teams’ second events. This time around, the base value is identical, but Davis and White made marked improvement in the GOE category, as well as bumping up the PCS scores yet again. Before you jump me for cross-event score comparisons, I know. It’s different. Judges are different. Pressures are different. All of the above, I know.But the point remains — the reaction to Davis and White has been better than the reaction to Virtue and Moir. Personal opinions on the choreography and interpretation aside, it ends up being a numbers game. So far, Davis and White are winning that game. Will the trend continue? This weekend’s head-to-head will be quite telling! Before you say it, I know. I missed NHK Trophy all together here at From the Boards. I hate that it happened that way, but last week was simply one of those weeks. Too many things on my white boards “to-do list,” and not enough hours in the day to get them all done. Something had to give. I’m sorry that it was here, but hopefully you caught my Fantasy preview at icenetwork.com or usfigureskating.org. I promise to always at least have that updated before events! 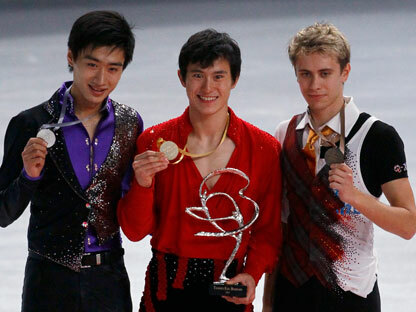 Since I can’t go back to NHK now, we’ll just take a glance back and this weekend’s even in Paris — Trophee Eric Bompard. I always loved this event (especially when it was Lalique) because of the fancy Kiss and Cry designs. Nothing too extraordinary this year, though. However, the trophy given to the winners was pretty spectacular! The Pairs and Dance events went off mostly as predicted. Russian stars Tatiana Volosozhar and Maxim Trankov proved themselves human with errors in both the short and the long, but the overall quality of their skating and the non-jump elements pulled them through. They’re going to need to regain the element of perfection, though, in the Final and as they head on to Worlds. Their teammates Vera Bazarova and Yuri Larionov snagged the silver after the cleanest of the free skates. There seems to be something missing from them, though. The spark from the other top couples is greater, despite B/L’s strong, classic lines. Most times I just don’t feel, well, anything from them as they skate through well choreographed programs (albeit, to overused music!). Duhamel/Radford skated another strong short program in Paris. One of the highlights of the entire event was Meagan Duhamel’s reaction to their scores after a well presented but poorly performed free skate. See, Duhamel and Radford are on that Grand Prix Final bubble. They needed to finish no lower than third with a score of 113.58 to give themselves a chance. She had her fingers crossed, watching the scores go up. But she knew it was enough. Despite three falls. “115 with three falls, Eric?” she added. These two improve with every event. I’m looking forward to seeing how they stack up at Worlds. Two down, four to go, friends! Skate Canada presented another series of season debuts this past weekend. Some hit, some missed. And now that it’s over and Cup of China is on the horizon, we have a few minutes to glance back in the rear view mirror and reflect. Shall we? Canadian royalty. That’s how Tessa Virtue and Scott Moir were received in Missassauga, as well they should be. Like their American counterparts, Meryl Davis and Charlie White, they are the class of a deep Canadian field, and the cream of the crop here. They seem to be one constant in a sport that has so few. Their spicy short dance won over the crowd instantly … and that’s no surprise. These two thrive on strong character dances and though they only performed it fully one time, last season’s samba free dance was the perfect preparation. Tessa oozes Latin flavor. It will be fun to see this up next to Davis/White’s SD at the Final. Their free dance is a totally different take on classic dance. Their “Funny Face” program is charming and challenging. While this isn’t my favorite look for them (at first glance, I feel it takes away from some of their best qualities — posture, line, depth of edges, emotional maturity), it’s already better than it was at Finlandia, and I expect it to continue on that path. Scott alluded to his “Fred-like-ness” in the Kiss and Cry, and that he definitely has going for him. Fred Astaire would be proud. Fellow Canadians Kaitlyn Weaver and Andrew Poje skated back to back strong programs. Both need more polish, but for their first event, I’m impressed by their improvements. The emotional depth they’ve added — especially in their free dance — is impressive. Anna Cappellini and Luca Lanotte have a gorgeous short dance. Their free dance didn’t impress me quite as much. They’re still a little rough around the edges, to be sure. But they are making great strides.